Gen Z Will Reinvent Your Business. Here’s How. New generations have always brought fresh thinking and new ways of doing things, but Gen Z will bring systemic change. Gen Z aren’t simply important because they’re the customers of tomorrow. A few recent Growth Strategy projects have made us realise that people born between 1995 and 2012 are essential to businesses today because they are the first generation of children who know what the future will be made of. What we’re interested in is not so much the surface – their tastes and the cultural quirks some or all of them might exhibit. Rather, it’s how they are a new type of consumer, shaped by an unprecedented wave of social and technological change. And what the implications are for businesses and innovators. When you’re thinking about your future, you are trying to figure out how you maintain and increase the success of the business in the face of continual change – in customer expectations and behaviour, in technologies and in your competitor set. This is nothing new: it’s the simple truth of innovation – Schumpeter’s “gales of creative destruction” which bring new products, services and business models to markets. While the first order for any business is to relentlessly improve the current offering, it’s also true that, at some point, the returns from one business will plateau and drop. To survive, the business must reinvent itself in some way and ‘jump’ onto the next curve of value generation. 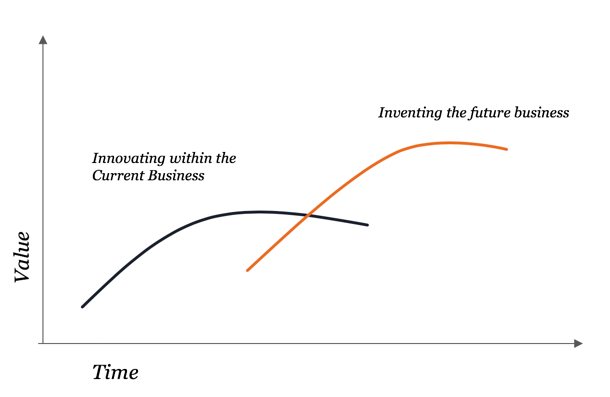 Successful businesses consistently manage to stay ahead of change: balancing innovation within the current business (curve 1) with strategic bets and rapid innovation on the second curve to identify and build the shape of their future business (curve 2). Many well-known companies have attempted that leap in recent times (e.g. Apple moving from hardware to software and to ecosystem; or Netflix from DVD by mail service to online streaming subscription); sometimes by themselves (Amazon extending from online retail into B2B cloud services), sometimes through exorbitant acquisitions (Facebook buying Instagram and WhatsApp), sometimes a bit late (IBM), and sometimes too late (Blackberry). During the last century, the societal rate of change – the broad beliefs people held, the way they communicated, transacted and organized themselves, influenced by exogenous forces such as world events or technology – was much slower than today, so generational change was subtler. For businesses back then, staying relevant to a new generation of customers was as straightforward as adjusting the current products or services that it offered – new products, value propositions or sales channels, as well as new communications, logos and slogans. Moreover, people with no autonomous spending power didn’t really matter to most companies. The majority of businesses wouldn’t pay too much attention to young people, beyond the fact they can influence or coerce their parents into spending. Catering to them would normally mean making ‘kid’s versions’ of regular products, for instance by slapping a Disney character on them. Curve 2 will be defined by the world that Gen Z, today’s children, are bringing with them. When thinking about Gen Z, we tend to get caught up in tiresome conversations about mobile games and social media. But technology and social media today has changed everybody’s behaviour, not just children. What sets Gen Z apart as a generation is social change. Child psychologists will tell you that the fundamental attribute of Gen Z is that they are the most ‘empowered’ generation ever. Gen Z are growing up in a world that has never demonstrated more appreciation and recognition for children. The parent-child relationship has never been more honest and equal. Children have also never been as acutely conscious of modern economic and environmental risks or simply uncertainty, and fully open and accepting of new social models, in life, relationship, work and ownership – which represent radical evolutions from traditional social moulds. For the first time in history, catering to Youth means more than coming up with a new product, new ‘look and feel’ or a new way to advertise: it means designing for the society of tomorrow. Despite being the first digital- and social-media-native cohort in the history of mankind, Gen Z are keen to visit high street stores more often than not, watch Hollywood blockbusters in cinemas the moment they come out and meet potential mates in real life rather than through an app while sitting on the loo. For them, tech is for them simply a tool or a delivery mechanism. It gives them unseen levels of autonomy and freedom, but hasn’t changed their profound human nature, needs, hopes and dreams. What tech has changed though, is that it makes Gen Z develop consumer behaviours earlier: they are exposed to the world at an increasingly earlier age and under a looser control from traditional ‘real world’ gatekeepers (e.g parents, teachers). They exhibit behavioural traits such as platform mentality, preference for control over convenience, very low brand loyalty and very low inertia. This will have radical implications on how businesses acquire and retain Gen Z customers, as well as measure and monetise loyalty. They don’t think in silos and don’t see a difference between a physical and a digital version of something: they only see the outcomes; therefore, technology-led solutions often fail because they tend to appear unnecessarily cumbersome. They are highly self-reliant; they value support services providing data-based advice designed to aid decision-making, but would tend to reject value propositions that don’t put them in control. They are pragmatists: their post-financial crash formative years has made them more realistic in how they approach life and plan for the future, and therefore prefer blunt transparency to what some marketers call ‘peace of mind’. They understand the value chain of social media; they are aware of the value of the data they generate and are happy to give it away, if it is part of a tangible value exchange. They intuitively understand the power of the collective, even with total strangers, as well as the effectiveness of collaboration and decentralised systems. They are asset-light: following previous young generations, and inspired by the ubiquity of Cloud everything, they are comfortable with various shared access models, over private ownership. Think of technology last: understand the outcome they are trying to achieve and their ‘jobs to be done’ versus ‘we need an app’; technology is only a tool and a delivery mechanism. Solve for groups of people: design solutions for groups of people, not only for individuals, couples or nuclear families. Friends, neighbours have strong mutual interests but currently have to hack what’s on shelf to make it work for them. Help consumers connect to people whose interests align with them and facilitate the creation of mutually beneficial interactions, generating additional value for all, with the aim to kick-start network effects. Put Gen Z to work: look at them as collaborators in unlocking new business or engagement models and harness their willingness to lean in. This does not mean asking direct questions in focus groups or online communities: what’s crucial is to observe and decipher how they live, how they grow up and what is shaping their lives, without them even knowing it. Increase your speed of learning: quickly build your first version of what’s next, and work with your next generation of customers to test, learn and iterate your way forward. Stop focusing on the competition: because the pace of tech and social change are accelerating, being obsessed with rivals won’t be enough to ensure you stay in the leading pack. It can be blinding and ultimately become detrimental to your future growth. Ask yourself if you’re adding to the clutter: think of new solutions through the lens of existing tools and channels, not by adding new entry points. Gen Z are not impressed by smartphone apps. One way to see the impact of new behaviours is to look at the rise of peer-to-peer businesses across different sectors. Peer-to-peer commerce has been around for a while thanks to eBay, and we’ve seen what peer-to-peer models have done to the taxi and hotel industry thanks to Uber and Airbnb. But consider what it might do to other industries. 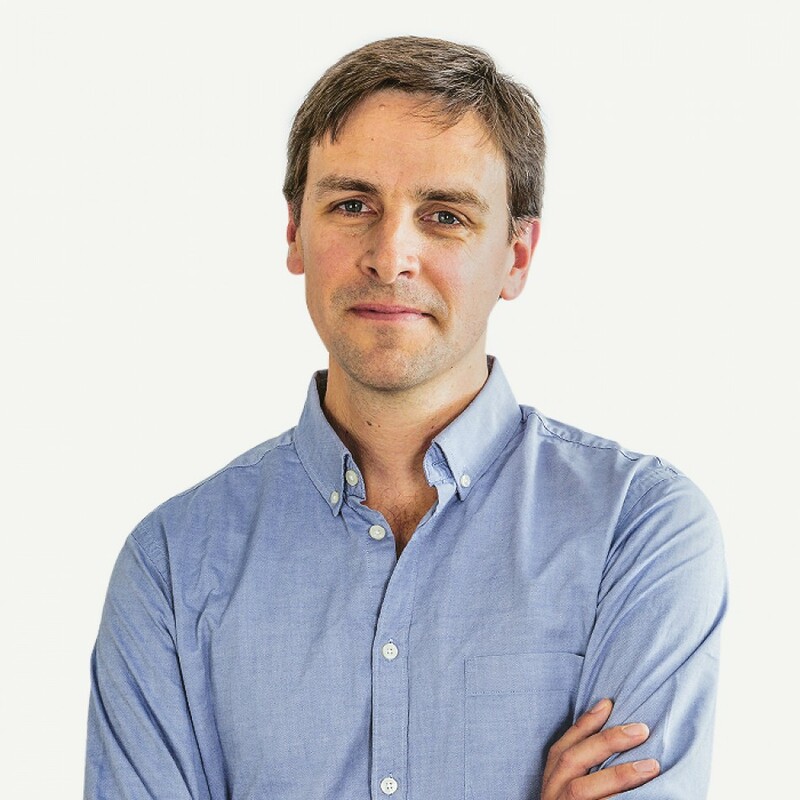 Stepladder is a new type of mortgage provider matching users to a ‘circle’ of people at the same life stage and level of income who save into the same pot, randomly selecting one of them every month to receive mortgage advances. What will peer-to-peer, decentralised systems look like in the travel sector, the customer service industry, or supply chains? While business leaders who grew up in the 80s and 90s might be perfectly comfortable with the ‘new’ of today – mobile commerce, social networks platform businesses, the challenge is to imagine, anticipate and prepare for the new of tomorrow – a world where these norms are adapted or disrupted, where a health service might run entirely within a chat interface, or sharing anything with a stranger is normal, or where informal communities of people across the planet self-manage an aspect of their everyday. Young people have always been important to businesses, at the very least because they are the ‘consumers of tomorrow’. However, with new generations, updating the logo, the UX or the tone of voice won’t be nearly enough. Gen Z can be the trigger for your future engagement and business models. With these three strategic approaches, strategy and innovation leaders have to anticipate and respond to the most important changes that this next generation of customer will bring – positioning their business to survive and thrive in this new world – and cater to the fundamental human behaviours that hold constant, irrespective of age, generation or technology. "Gen Z Will Reinvent Your Business - Here's How" was hosted as an Innovators' Circle event by Fahrenheit 212. Download our event booklet below to get insights on what makes Gen Z unique. Franz is an Innovation Consultant in the Idea Development team. 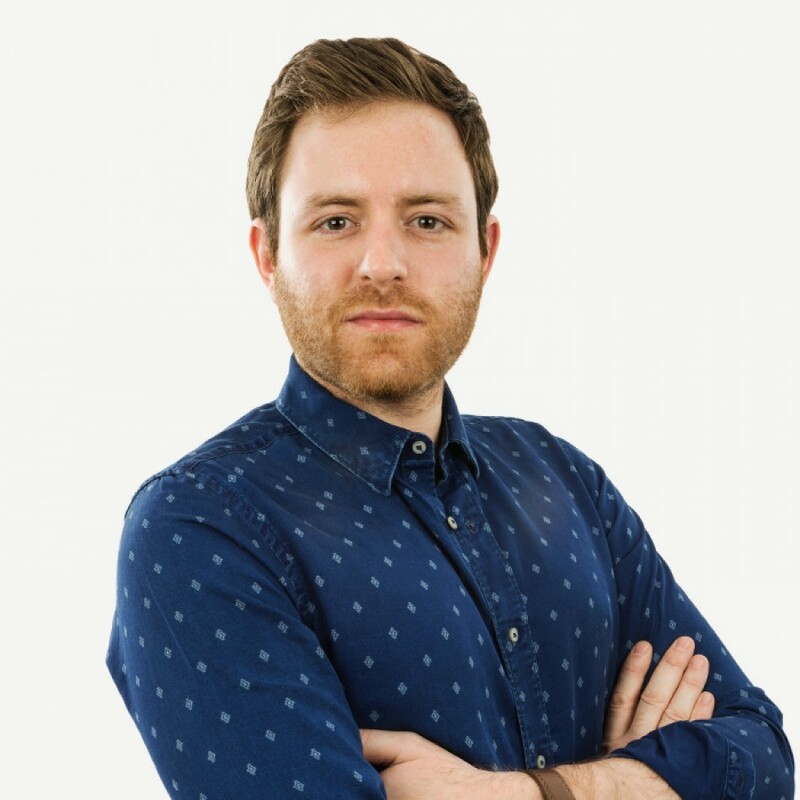 Combining his passion for beautiful brands with a low tolerance for incoherent and disjointed customer experiences, he uncovers insights and develops solutions to invent products and services that solve for the consumer and the business.